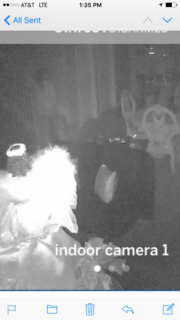 Ghosts & the Supernatural – Kim Wilson is experiencing a Caucasian girl ghost in her house and her security cameras caught the full body apparition. The family lives in Elk Grove. The ghost girl looks like she has black hair and is wearing pajamas. When I was conducting an EVP session tonight, Kim Wilson said: “Please come out” and when I played the recorder back, you could hear footsteps by this huge mirror, a mirror that Deanna detected benevolent energy surrounding it, and possibly a portal. Kim says that she felt energy at this mirror too and said that the paranormal activity started when the mirror was brought to her home. Kim says some of the paranormal that is happening at her home are lights turning off and on. Sometimes this happens at 4 in the morning. The Surround Sound will come on by itself. She tells Deanna and me, that there are many cold spots in the house at times. Certain areas of the house will stay cold. When taking pictures in one of the living rooms, we were capturing orb activity. When I commanded the orbs to appear in one certain area, the orbs would appear in the area that I was pointing at, showing intelligent movement. These orbs I can deem as S.C.F. (Spiritual Containment Fields). SPECIAL NOTE: Pajamas Ghost Girl looks like she has pajamas on, henceforth the name. There are 4 foster children (girls) that live in this house and all of them have fallen down the steps, as if they were pushed by an entity. The girls have all heard the drawers open and close by themselves. They also hear foot stomping going up the steps and there is nothing there. One time, a person that was visiting saw a hand in the bathroom and the hand looked like it was real, made of living flesh and blood. Deanna felt the presence in this home and was getting goosebumps up and down her arms. Deanna conducted a palo santo wood cleansing and I conducted a Roman Catholic house blessing with holy water. Kim felt the 4 girls needed a full submersion baptism. I baptized all 4 girls this evening with Deanna’s assistance.